Please head on over to Creating with Chrissy for all future are work!!! HAPPY SATURDAY Everyone! 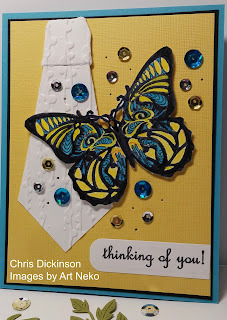 Today I am sharing a card I made last week using the what a FUN challenge! Today, I am headed to the Ozaukee County Fair to work a Vendor Show for my Norwex booth. I created the napkin by making a tie out of cardstock and dry embossing it. The COOL images I used are from Art Neko. The Butterfly Sheet - A324FSHT - Butterflies, Siamese Cats, Pagodas, and a Wee Boy Catching Butterflies from Art Neko, you can purchase the images on a sheet and save a few dollars OR you can get them individually! Enjoy your weekend! Thank you for stopping by! This week, I will be working at the Ozaukee County Fair, so if you are in Wisconsin, stop by and say hello! 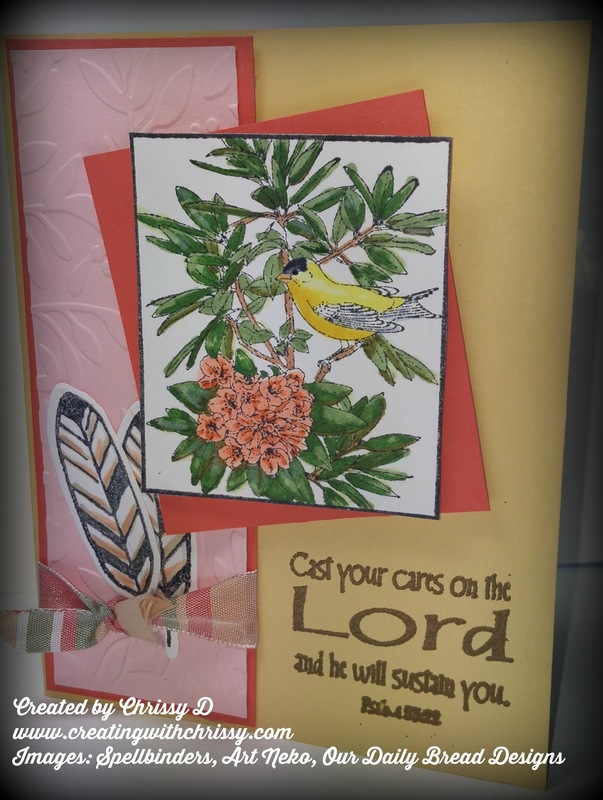 Last week, I played along with Splitcoast Stampers Color Challenge and created this card. I am just LOVING this Bird Stamp set!!! You can get them at Art Neko -Washington Goldfinch & Rhododendron. I also used the stamps from Spellbinders Feathers, Scripture by ODB. Dry Embossing folder, Big Shot, Heat Tool. Dimensionals, Gold EP, Embossing Buddy. Thank you for stopping by! I am headed out to the fair!